Young Cambridge rockers The Treatment got the night off to a flying start with a great rocking performance. With a new album due out in February, tonight's set includes a mix of songs from their first album and the forthcoming album. They kicked the set off with "Drink, F**k, Fight" from the first album before giving us several songs from the upcoming album and then closing the set with another song from the first album - Shake the mountain. It's good to hear the new material - it sounds great, and goes down very well with the crowd too - definitely an album I'm looking forward to hearing. With a sound that contains ACDC influences they're an excellent choice to support Airbourne and the way the crowd responds to their set shows how good a pairing it is. A great start to the night. Orange Goblin were next up. The heaviest band on the bill tonight they really put in a great performance. Singer Ben Ward towers over the crowd and leads the band as they power through an impressive set. Whoever put the tour together made some great choices - all three bands have their own sound but all manage to appeal to the same audience. Then it was time for tonight's headliner, Airbourne. By this time the venue was completely packed and temperatures were soaring. Right from the start they made an impact - bright lights behind them made a visual impact, and the intro tape was loud. As the band hit the stage and went straight into the first song, things went from loud to LOUD. Airbourne aren't a band to take things slowly and from the opening song (Ready to rock) right through to the last song (Stand up for rock'n'Roll), they give 100% and play at full speed and power. Singer Joel O'Keeffe isn't one to stay at the microphone stand for long and when not singing he's racing around the stage. 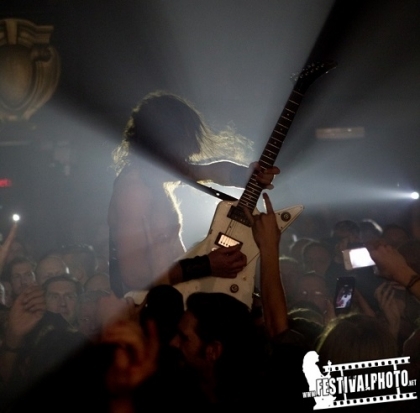 Quite early on, during "Girls in Black" he comes to the front of the stage, climbs onto the shoulders of a member of the crew and then heads off into the crowd, and tours the venue while still playing guitar the whole time. Eventually he heads back to the stage and carries on the song. While most bands enjoy a bottle of water or a beer during a gig, Joel knocks back a bottle of wine (appropriately he downs the bottle of wine during the song "Cheap wine & Cheaper women". Tonight they choose to play "Hungry" which Joel introduces as a song they hardly ever play live and says that it's probably only something like the second time they've played it. During "No way but the hard way" Joel gets a spotlight that he uses to shine on members of the audience. They end the set with "Stand up for Rock'n'Roll'. The set only lasted an hour, but with such a high energy set then it feels long enough. The encore started with Joel standing on top of the speakers, before he jumps down to sing the first of three songs in the encore - "Live it up". Three great bands on one bill - that's good value for money for ticket-holders, and all three bands put in great performances tonight. 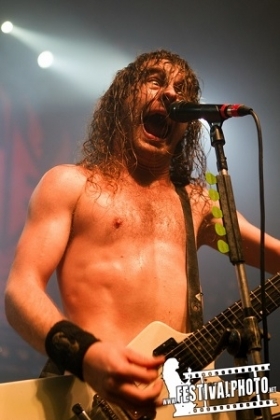 While The Treatment and Orange Goblin put in great sets, Airbourne still surpassed them. A great night of music.